Guys, it's taking all my willpower not to title this post "Star-Spangled BANANNER Bread." Everything I know about SEO is telling me that I really, really shouldn't, but everything I know about puns is telling me that I really, really should. Practicality wins again. Speaking of practicality, this recipe is oozing with it. 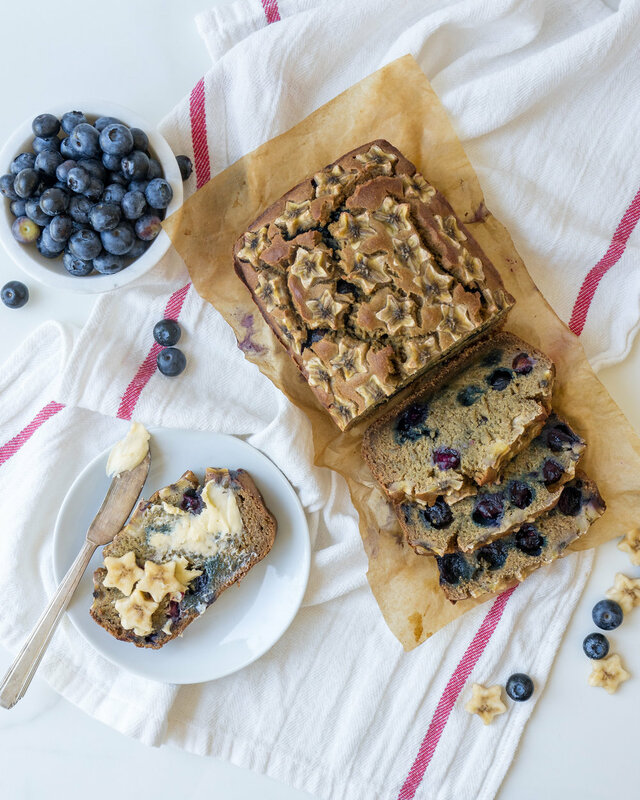 Ok, maybe not the banana stars (which are excruciating to cut out, but make for an oh-so-festive touch on the Fourth of July), but everything else about it is exceedingly practical. For one, it's full of healthy ingredients that almost no one could argue with, and for another, you make the batter in your blender. That's right, you just dump all the ingredients in the blender and whizz to combine. And hey, if you're short on time, you can skip the banana stars. As my old pal Ben Franklin used to say, "employ thy time well, if thou meanest to gain leisure." So he'd understand if you skipped the stars. Nobody's calling you un-patriotic. 1. Preheat the oven to 350 degrees F. Line a standard loaf pan with parchment paper, and lightly coat with cooking spray. 2. Place bananas, oats, eggs, maple syrup, baking soda, vanilla, and salt into the blender, and blend until just combined. Be careful not to over-blend! Fold in blueberries gently with a rubber spatula. 3. Pour batter into the prepared pan, and arrange banana stars or slices on top. Bake until a toothpick comes out clean, about 35-45 minutes. 4. Let cool in loaf pan for 15 minutes, and then using the edges of the parchment, gently lift the loaf out of the pan and place it on a rack to cool. Cool completely before slicing. Serve with butter, jam, or almond butter. It’s official - as of today, summer is here! Sunny days lie ahead, full of picnics, beach trips, and of course, plenty of vibrant summer produce. The arrival of peaches in the markets was the first fragrant sign of the season’s change, and we couldn’t help but pile heaps of them into our shopping carts (both real and virtual, thanks to Milk & Eggs grocery delivery). If the summer heat already has you dreading getting into the kitchen, these cool and satisfying chia pudding parfaits are for you - they’re a great way to dress up your breakfast and take full advantage of all those peaches you may or may not have hoarded, and there’s absolutely no cooking involved. Plus, you’ll crush your hunger through lunchtime by loading up on protein, fat, and fiber. Feel free to swap out for a plain yogurt of your choice - vegan or lower/higher-fat varieties will work well, though take note that Greek-style will hold up best for a pretty swirl effect on top. If more protein is what you’re after, try mixing in your favorite vanilla protein powder to the vanilla “cream” (but be sure to reduce maple syrup quantity to account for a sweetened powder). 1. Begin by preparing the Peach Yogurt Chia Pudding. Place one container yogurt, cubed peach, maple syrup, and chia seeds in a small food processor or blender, and process until the peach is completely puréed and the mixture is smooth. (Note: some chia seeds may remain whole depending on the type of processor you use, and that’s ok! The mixture will thicken either way.) Decant mixture into a container, cover, and refrigerate overnight. 2. To make the Vanilla Bean Yogurt "Cream," add maple syrup and vanilla bean paste to yogurt and mix well (you can do this directly in the container). Add additional maple syrup if desired for a sweeter flavor. Chill until ready to assemble parfaits. 3. To assemble, alternate adding peach yogurt chia pudding, vanilla bean yogurt, and chopped peach and almond toppings into two serving containers to create a layered effect. Serve immediately. Groceries for this post were kindly provided by Milk & Eggs, our favorite grocery delivery service! All opinions are our own. Many of my most vivid memories revolve around food. I don't remember much of my childhood, most of it is a pretty blur now, but I can remember clearly my mom's banana-nut pancakes. I can see her whisking together a batch on a leisurely Sunday, while my dad and I lounged around the kitchen, still in our pajamas. Maybe we'd help her with mashing the bananas (even though she was really the best at that) or chopping up the frozen pecans that Grandpa had sent from Mississippi, while she started heating up the near-ancient griddle (which probably still makes perfect pancakes to this day). I remember how perfect those pancakes looked and smelled, how fluffy they were on the inside, and how satisfying each bite was - especially those bites that had a nice crunchy pecan inside. Pure, sweet, Sunday heaven. So with today being Mother's Day, and my mother being three thousand miles away, you can imagine how badly I might be missing her. And, how much I might be wishing for a plate of her banana-nut pancakes. 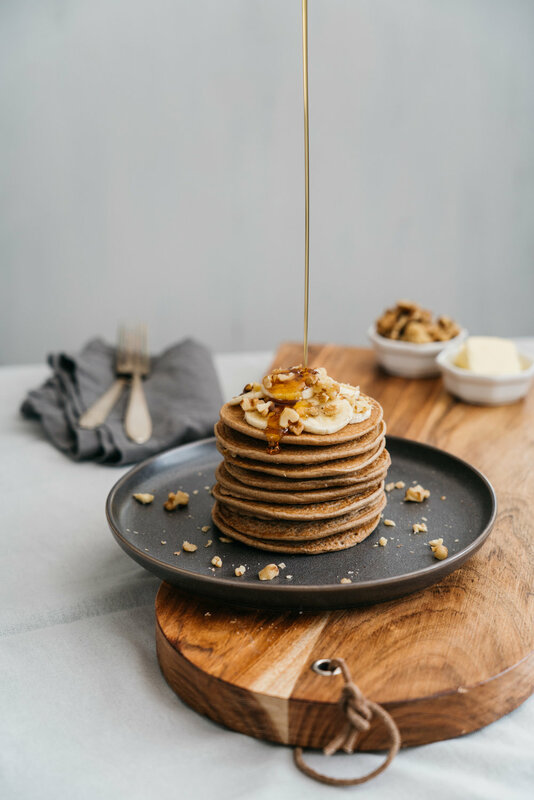 While it's impossible to recreate those perfect pancakes of my childhood, I have found that this absurdly simple recipe can help satisfy my crazed banana-nut nostalgia. Better yet, I've adapted it to meet my current low-FODMAP diet needs (more about that here), and even better yet, you can make this in your blender, so cleanup is a snap. I like using buckwheat flour here when I have it on hand, because I enjoy its earthy, nutty quality. Feel free to sub out another type of flour if you'd prefer. Walnuts are a classic partner to banana, and I like them in my pancakes, but you could also use pecans (which would be more faithful to my mother's version), hazelnuts, or whatever you have on hand. Maybe even chocolate chips, if you're feeling wild! Treat yourself - it's Mother's Day, after all! 1. Place the oats into a blender, and blend until they have reached a flour-like consistency. 2. Add the buckwheat flour, baking powder, cinnamon, and salt to the blender carafe and pulse to combine. 3. Add the bananas, eggs, almond milk, and maple syrup to the blender. Process until well combined, about 30 seconds. Let the batter rest for about five minutes. 4. While the batter is resting, heat a nonstick or cast iron skillet over medium low heat. Lightly grease the skillet with butter or oil. 6. Working in batches, add heaping quarter cups of batter into the hot skillet, gently spreading the mixture into circular shapes if needed. Sprinkle the chopped walnuts onto each pancake while the batter is still wet, about 1-2 tsp per pancake. Once the edges begin to appear dry and the bottom sides are golden brown (about 3-4 minutes), flip each pancake and cook for another 3-4 minutes, or until cooked through. 7. Transfer to a 200 degree F oven to keep warm or serve immediately with maple syrup. * If not following a low-FODMAP diet, you may use ripe or unripe bananas! For individuals eating low-FODMAP, bananas that are still slightly green on the outside are best, per Monash University. ** If you're not low-FODMAP and are making these with ripe bananas (see above), feel free to omit the maple syrup - they're pleasantly sweet without it! For someone new in town, the concept of “Hollywood glamour” might appear a myth, gone the way of silver gelatin film, a remnant of the movie business’ golden days. Walking down Hollywood Boulevard, only hints of classic-movie splendor remain; cement handprints of celebrities are set amongst a squeaky-clean tourist-friendly facade, well-polished stars bedeck sidewalks stretching through even the sketchiest parts of town. 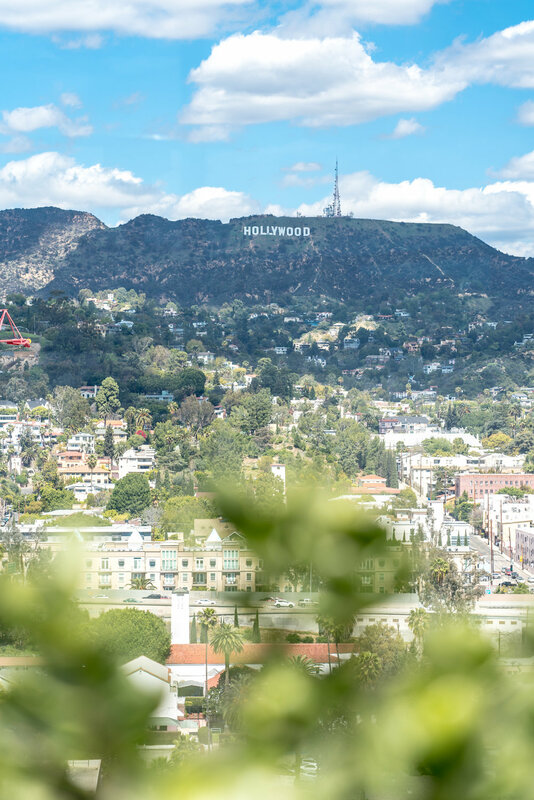 But those who live and work in this town know that the glamour is alive and well - it’s just well-hidden (Hollywood thrives on exclusivity, after all), waiting to be found. If you know where to look, a sparkly world of VIP rooms and upscale pool parties awaits. The glamour doesn’t end with velvet-roped nightlife, either - in Hollywood, even brunch can be taken in style. 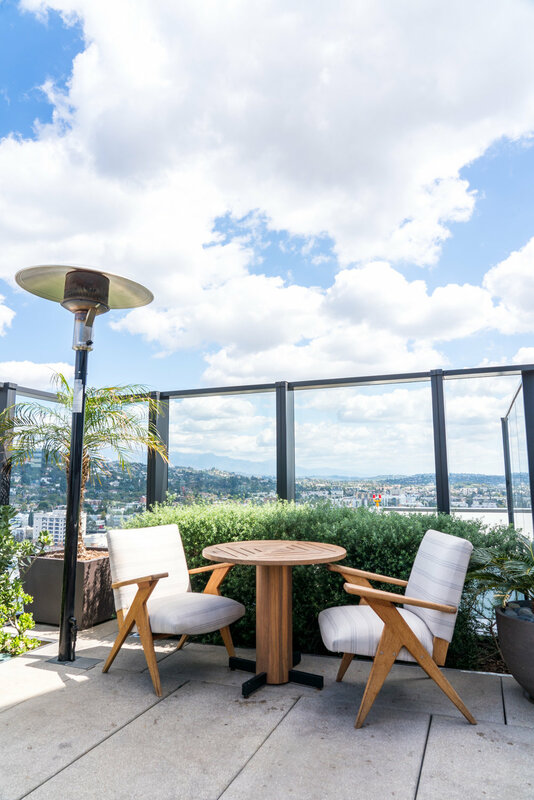 Case in point: the visually stunning Filifera, perched atop the trendy Hollywood Proper Residences. 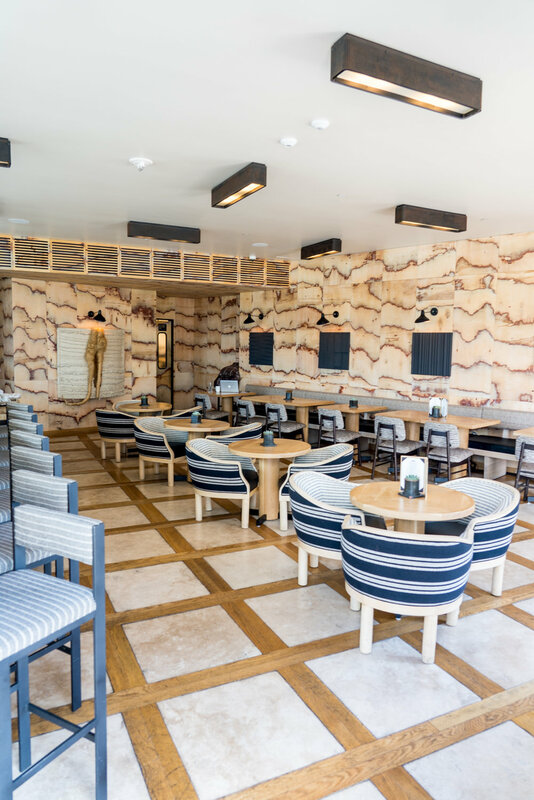 Getting to Filifera can feel a little bit like going down the rabbit hole - a valet will take your car, a doorman will show you in, and a receptionist will usher you to the correct elevator. After your ears pop from the rapid ascent, the doors open on “R,” and suddenly you’re surrounded by jaw-dropping beauty. The view is something to behold - it’s a bit magical to see your city from a new perspective; we probably could have spent hours pointing out our favorite landmarks and finding all our old apartments. But the zen-like roof deck is stunning in its own right. With a narrow gleaming pool, cozy tucked-away seating areas, an impossibly chic bar, and lush greenery abound, Kelly Wearstler’s design oozes modern sophistication. 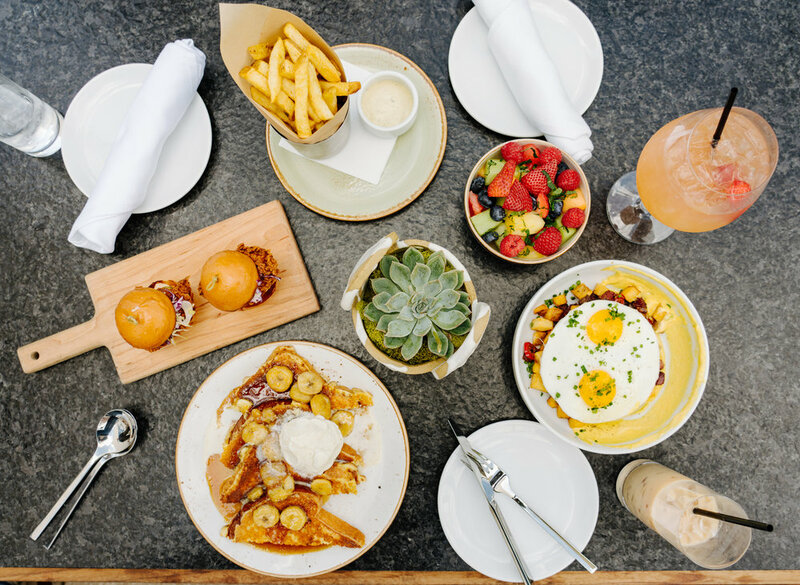 The menu is just what you’d hope to find at an L.A. brunch - there’s a kale salad for that healthy friend, a tofu scramble for the vegan friend, and a hearty corned beef hash for the friend with a hangover. There’s also plenty to indulge in - we fell in love with the completely decadent Bananas Foster French Toast, for one. 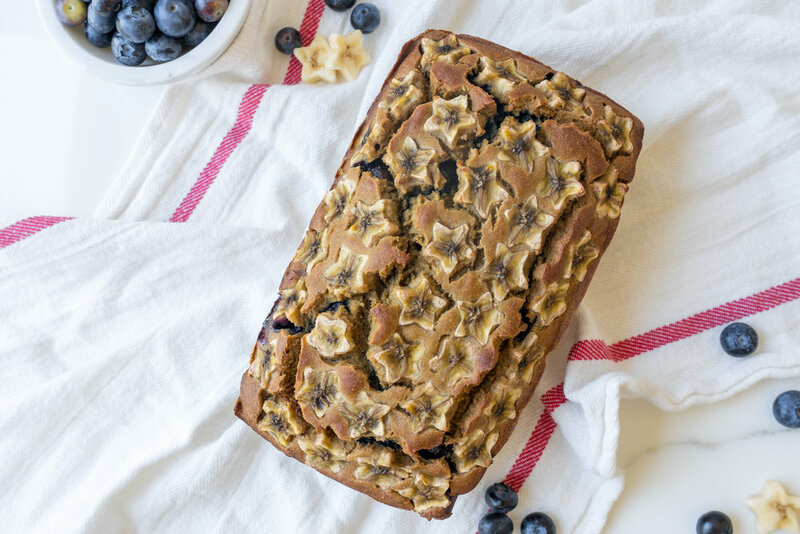 Topped with McConnell’s ice cream and caramelized bananas, this was a melt-in-your-mouth treat. We also adored the Fried Chicken Sliders, a fun take on the sandwich craze that’s sweeping the city - we only wish we’d ordered more! Don’t forget to order yourself a cocktail, as well - Filifera's day job is as a cocktail bar, while brunch is its new gig on the weekends. We loved the peppy House Sangria, which you can enjoy with your choice of red, white, or rosé wine. When the daily routine's got you down and you need a little poolside old-school Hollywood-style glam, Filifera's got you covered. 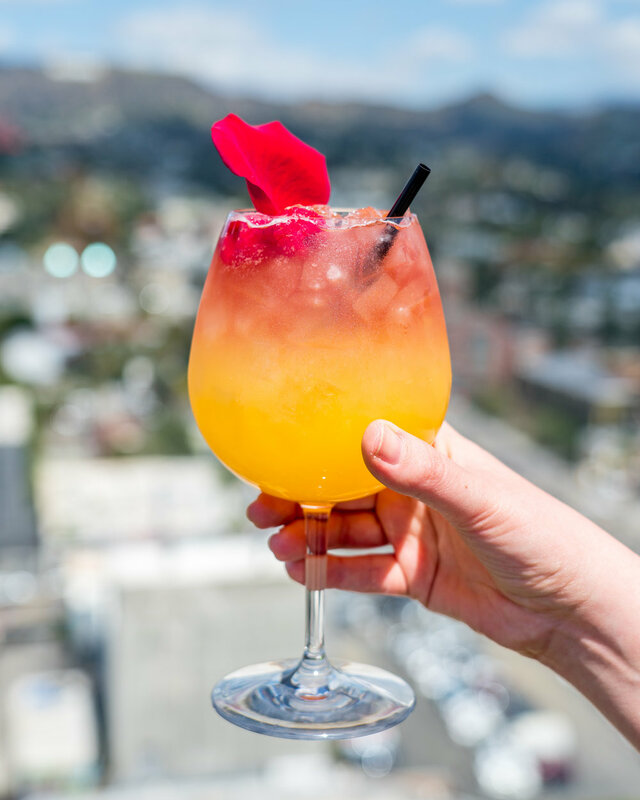 Whether you come to bask in the sun during brunch, or take in the sunset with a cocktail after work, you'll leave feeling refreshed and oh-so-fancy. Thanks to Filifera for hosting us for this brunch! As always, all opinions are our own. I don't need to wax philosophical for you about the magnificence of breakfast tacos. 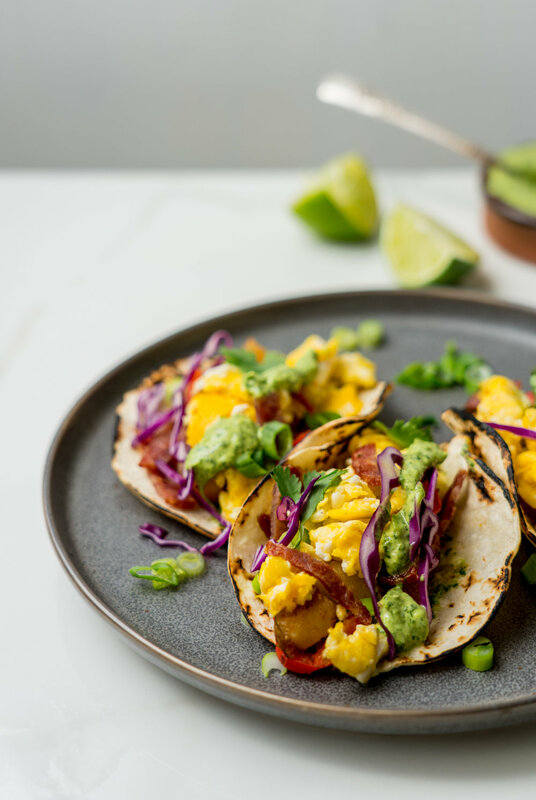 I know it, you know it, we all know it - eggs taste awesome tucked inside a warm tortilla. 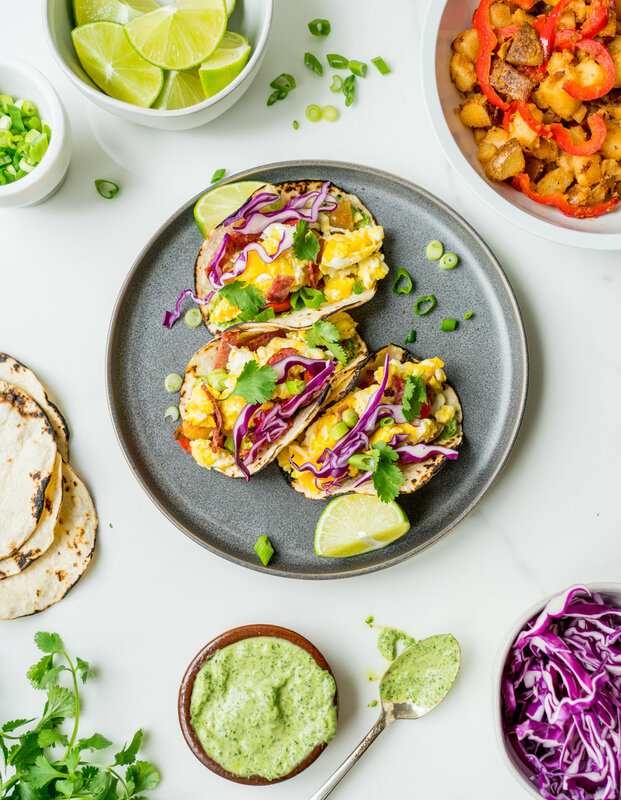 Add some flavorful accompaniments like savory chopped bacon, smoky potatoes and bell peppers, crunchy cabbage, and a zippy cilantro crema, and you're on the fast track to breakfast heaven. In my opinion, whether you opt for corn, flour, or otherwise, the fastest way to taco nirvana is to thoroughly char your tortilla. This simple step brings a toasty earthiness and an oh-so-satisfying crunch that you didn't know you were missing. I char mine directly on a gas burner for a few seconds on each side (no frying pan required), but you could also pop them under the broiler for a few minutes to achieve a similar effect. 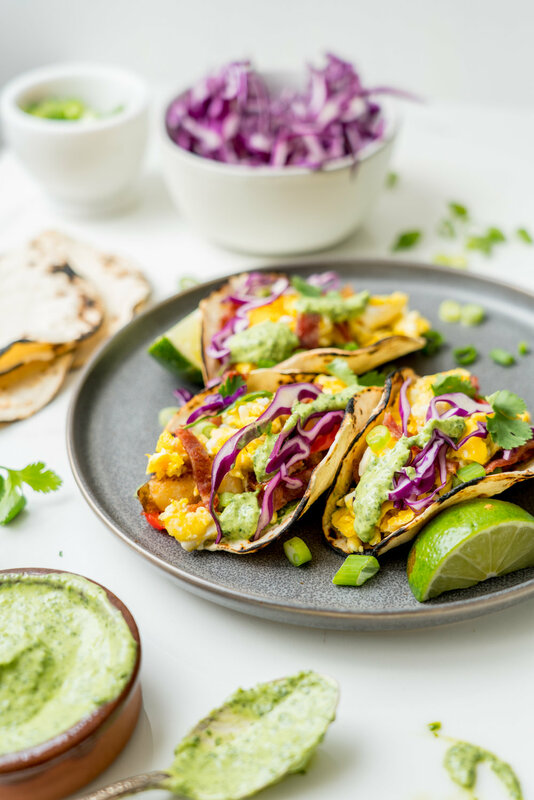 These tacos are a great way to sneak some extra pep (and veggies) into your breakfast routine, and if you make the veggies and the sauce ahead of time, they will come together quickly enough for a weekday breakfast. 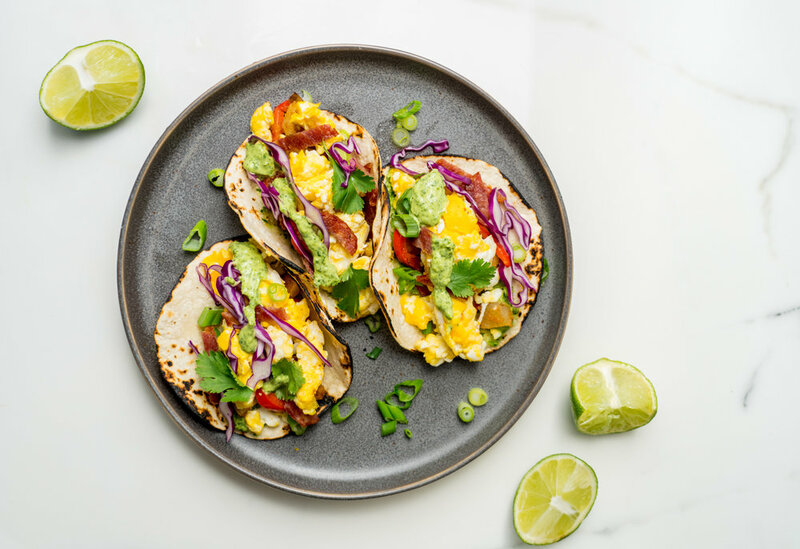 We love using tiny street-taco sized tortillas from Milk & Eggs, but you could easily use larger ones and stick with 1-2 tortillas per serving. A quick note - this recipe is entirely low-FODMAP, meaning it's low in certain carbohydrates that can be irritating to people with digestive disorders. 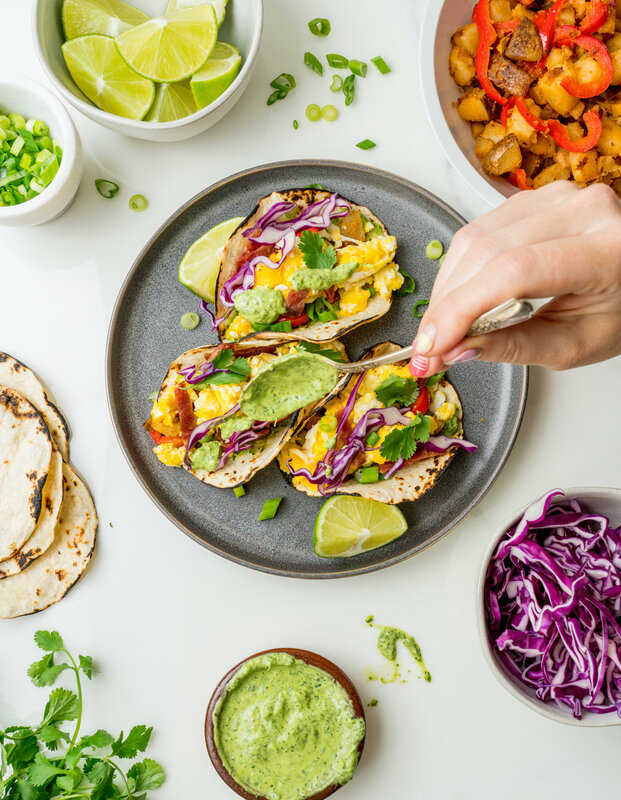 I'm currently following a low-FODMAP diet for the short term (as prescribed by my doctor to help alleviate some tummy issues), and have enjoyed experimenting with my favorite recipes to fit my current diet! If you and your belly are in a good place, and you want to kick things up a notch and add in some super-tasty FODMAP foods (hello, garlic and onion! ), feel free to toss in a diced onion with the potato mixture, or top your tacos with your favorite salsa. Go crazy! First, make the cilantro "crema" by combining the mayo, cilantro, and lime juice in a small food processor or blender. Process or pulse the mixture until it's well combined, and it's taken on a bright green color. Season to taste with salt and pepper. Transfer to a jar and refrigerate until ready to use (note: you'll have leftovers, so try it on burgers or as a dip with veggies!). To make the vegetable filling, begin by placing cubed potatoes in a medium pot and covering with cold water. Bring to a boil, then simmer about four minutes, or until potatoes are tender. Drain thoroughly and set aside. While the potatoes boil, cook the bacon to desired crispiness in a large skillet, following package instructions. Once cooked, the bacon to a paper-towel-lined plate to drain excess oil and allow it to cool. Once it's cool enough to handle, give it a coarse chop, or crumble it with your fingers. Using the same skillet as used for the bacon, toss the potatoes, bell pepper, and spices in the bacon drippings (note: if using turkey bacon, you'll want to add some extra oil to keep the veggies from sticking to the skillet). Cook over medium heat until the peppers are soft and the potatoes have browned slightly. Set aside. In a separate, nonstick skillet, warm the olive oil or butter over medium-low heat. Add in the eggs and whisk them in the pan using a rubber spatula (this is similar to the Gordon Ramsay style, but we find that doing it over low heat allows you to keep the pan on the burner the whole time. That back and forth bit he does is exhausting). Continue to gently push and fold the eggs together until they begin to set. Remove them from the heat and set aside just before they look fully cooked, to avoid drying them out. Season with salt and pepper to taste. Now it's time to assemble your tacos. Fill each tortilla with a heaping spoonful of the potato mixture, followed by the eggs, and a bit of crumbled bacon. Drizzle on some cilantro "crema" and sprinkle on shredded cabbage, green onions, and cilantro as desired. Serve with a slice of lime. *To char your tortillas, place them directly on a lit gas burner for 5 - 10 seconds on each side, using tongs to flip halfway through. Be sure to keep a very close eye on them if you use this method; they can go up in smoke quickly if left unattended! If you don't have a gas burner, you could also pop them under a hot broiler for a few minutes to achieve a similar effect. Note: potato + bell pepper mixture portion of this recipe has been adapted from The Kitchn.